+Edward Delzio You have to site evidence for government printing leading to increased productivity. You cannot just make claims without evidence. +Labmath Mathgeek OK, sure…Let’s start with the gov’t printing done to build the ‘arsenal for democracy’ that defeated fascism, liberated Europe, and won WWII. +Edward Delzio You cannot just say things like these without showing that money printing was in fact necessary for those things to happen. Which means bringing data and theories to the claim. +Edward Delzio I have no intention of buying a copy to do the hard work of checking your claims. I would not mind doing the work if you give me a free copy (pdf preferred). +Labmath Mathgeek Hmmm, I see…My deficit spending (paying for the book) is necessary for your productivity (reading the book). Treasury and Fed officials should then just level with themselves, level with the American people, and pivot away from the old, outdated, gold-standard-era beliefs that are no longer applicable in the post-gold-standard, modern monetary system. Educate the policymakers, and educate the citizenry, that since the gold standard era ended, the federal government is no longer subject, no longer constrained, to a gold-backed dollar currency, and now instead has full monopoly control of its own fiat dollar currency as the issuer. Explain to everyone how the federal gov’t used to have to first borrow someone else’s gold-backed dollars before deficit spending, but since August 15, 1971 there is no such thing as a gold-backed, gold-convertible, nor pegged dollar anymore, and now the federal gov’t just creates new fiat dollars whenever deficit spending. “Monetizing” debts of gold-backed dollars was replaced by “monetizing” deficits of fiat dollars. The federal gov’t can admit that it no longer needs to stick to the narrative that Treasury ‘debt’ issuance to ‘borrow’ fiat dollars is still needed to finance federal deficit spending. Congress still has to approve federal gov’t deficit spending just as during the gold standard era, but that is the only reason why Treasury bonds are issued today in the post-gold-standard era, to simply keep a running total of the amount of deficit spending, the amount of new cash that was created after being approved by Congress. Post-gold-standard era, the amount of new cash that is created by the federal gov’t is no longer a dangerous financial threat, but just an indicator, like a light on your car dashboard, that tells us how much new cash plus old cash (taken in by federal taxes) makes up the mix of dollars circulating throughout the economic ecology at any given point in time. If too high an amount of new cash is being created (the ‘federal budget’ has a large ‘deficit’), it just indicates that the economy is relying too heavily on the federal gov’t, so policymakers must immediately sync their fiscal and monetary policies to get growth going in the nonfederal gov’t. When re-calibrating these fiscal and monetary policy decisions to counter this low nonfederal gov’t aggregate demand, you are NOT trying to balance a gold-standard-era federal budget, but instead trying to balance a post-gold-standard era federal economy. Treasury bonds today are no longer federal government debt like during the gold standard era because they are now denominated in fiat dollars, which are not backed by gold or fixed to anything, and these Treasury bonds are sold by the federal gov’t which is the issuer of these fiat dollars. The federal gov’t , the issuer of dollars, does not need to ‘borrow’ dollars from anyone anymore, and why buyers of Treasury securities today are not ‘lending’ dollars to the federal gov’t, but merely making a time deposit at the Fed, like buying a CD at any bank. In the gold standard era, when the federal gov’t deficit spent gold-backed dollars, it added to an outstanding float of national debt; post-gold-standard, when the federal gov’t deficit spends fiat dollars, these newly created dollars subtracts the purchasing power of the outstanding float of dollars. Finally, to quell the unnecessary fear over a ‘national debt’ that hasn’t actually existed since the gold standard era ended, the effort should be made to educate everyone exactly how federal government financing in the post-gold-standard, modern monetary system really works: During the gold standard era, the people’s surplus savings of gold-backed dollars financed the federal government’s deficit spending of gold-backed dollars; however, since then, it has reversed. Post-gold-standard, in the modern monetary system, the federal government’s deficit spending of fiat dollars finances the people’s surplus savings of fiat dollars. 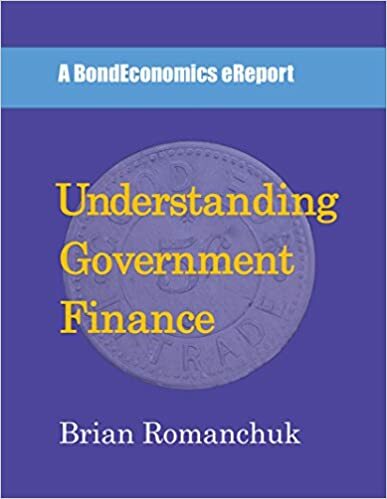 Whether you are a devout follower of Modern Monetary Theory (MMT), or have never heard of it, I highly recommend ‘Understanding Government Finance’ by Brian Romanchuk, who is a Quebec-based fixed income quant analyst and publishes the website Bond Economics. Mr. Romanchuk’s expertise on the subject matter of government finance is evident, he has a B.Eng. in electrical engineering from McGill University, a Ph.D. from the University of Cambridge in control systems engineering, and is a CFA Charterholder. In May 2015, Brian Romanchuk was named by the Fixed Income Database newsletter as one of the ‘Top 10 Fixed Income Experts Worth Following’. As per Mr. Romanchuk, the study of economic models, just like the study of mathematical models, includes understanding the rules, called constraints, that govern the behavior of variables in any highly complex system. These constraints affect the interrelationships of variables with all other entities within an economy, and understanding of these constraints (or the lack of constraints like a currency peg / gold fix) helps determine economic outcomes. Mr. Romanchuk correctly takes aim at the pre-financial-crisis, US money market system, saying that it’s “negligible capital requirements exacerbated the crisis”, and generally “dragged US banks into the mess”. This is true. In ‘Stress Test’, written by former Treasury Secretary Timothy Geithner, US money markets were part of the tri-party repo market which seized when Lehman went bankrupt on September 15, 2008, magnifying the crisis. As a result of this interconnection and heavy reliance on the repo market for intra-day credit, the US Federal Reserve Bank’s macro-prudential policy today is to reduce the role of US money markets, broker-dealers, and clearing banks in the tri-party repo market. In another clever observation, Mr. Romanchuk writes that US Treasury debt management officials have “painted themselves into an elaborate corner” by continuing to stick to the narrative that Treasury debt issuance is still needed to finance federal deficit spending, and that pure market forces alone determine the interest rates set at Treasury bond auctions (even though the gold standard era ended and the federal gov’t can now issue fiat dollars at will). In ‘Understanding Government Finance’, Mr. Romanchuk wastes no time pointing out many of the common misconceptions by citizens regarding central government financing and the nonsensical tools used worldwide by monetary policymakers such as “counter-productive” US reserve requirements, “crazy” European negative interest rates, “meaningless” central government budget constraints, and “silly” Japanese quantitative easing. QE was first deployed in Japan in the 1990s and now practiced globally because central bankers yearn “to remain relevant after lowering policy rates to zero”, Mr. Romanchuk quips in yet another hits-it-on-the-head passage. The National Debit is a straightforward read, particularly for those with experience in the financial markets. It focusses on the aspects of MMT that are of most interest for financial market participants, particularly for fixed income investors. The attraction of MMT is that offers explanations for bond market behaviour that are counter-intuitive from a “mainstream” point of view. The book does not attempt to cover the wider theoretical debates within economics, which erupt periodically across the internet. My ebook — Understanding Government Finance — covers similar ground, but I deliberately avoided making it purely an introduction to MMT. The reason being is that I find it somewhat difficult to distinguish MMT from the wider post-Keynesian school of thought. In Marc Lavoie’s graduate text on post-Keynesian economics (reviewed here) covers the schools of thought within post-Keynesian economics. He sees underlying similarities, creating what he calls “broad tent” post-Keynesian thought. Modern Monetary Theory fits within that broad tent, with a coherent view on certain topics. What distinguishes MMT from others is the emphasis on monetary operations, as well as the embrace of free-floating currencies. Delzio follows the conventional line about the role of interest rates (that lower rates are stimulative for the economy), although he notes the MMT dissent about the effectiveness of Quantitative Easing. The belief that low interest rates are ineffective is not considered a “core belief” of MMT, even though Warren Mosler (one of the “founders”) advances the idea. Although an interesting area of debate, it was probably a good idea to avoid it as being too much for most readers to absorb at once. Voters think that the federal government is the same as a household, that the household must not deficit spend too much, or else the household will get into more debt and the household budget will get more out of balance. Likewise, politicians refuse to consider more federal deficit spending because they believe it will increase the national ‘debt’, and the federal ‘budget’ will get more out of balance. Everyone has this backwards. Once the federal gov’t, the issuer of dollars, balances the economy, the federal ‘budget’ will move towards balance, not the other way around. Until the public and by extension, the country’s politicians, grasps this, stops their medieval thinking, the Fed, and also by extension, the world’s central bankers, have no choice but to keep saying: “More ZIRP” (or just like Steve Martin said in that classic Saturday Night Live parody: “More Bloodletting”). That’s why I want to pull my hair out when I watch the Jackson Hole theatre. Guys, you’re not helping! I was dumbfounded by the stultifying, excruciating more-of-the-sameness that came out of Jackson Hole. Oh my god, are we really saying that the entire FOMC decision-making process comes down to whether there’s a good jobs report on Friday? Why don’t we just inspect the entrails of a goat? To riff on Woody Allen’s famous joke, we need the eggs. We need a stock market that goes up, not down. We need financial asset price inflation. We need the eggs so badly that we’re willing to support the magical thinking crew and smile at their courtiers even though we think they’re totally out of touch with reality. We’ve become so used to getting our eggs delivered on time and without fail that our first, second, and third responses are to ask for more magical thinking from the incumbent priest-kings, not less. This is a dangerous, myopic game. Because we will get what we ask for. We will get more magical thinking.